Recent Marine Scene newsletter articles have highlighted efforts to survey bay scallop populations in southwest Florida and efforts to restore scallop abundance to levels not seen in several decades. The hope is that improved water quality and recovery of seagrass beds will set the stage for a recovery in local scallop populations. Experimental releases of scallop larvae raised in a hatchery are now underway. Scallops have been spawned and then cultivated for about 10 days until they reach the point where the swimming larvae are ready to settle out of the water and take up a bottom-dwelling existence. The hope is that by reducing their two-week free swimming larval stage, a much higher percentage of scallops will survive to settle. Also, since they will not be floating about in the water for weeks they should settle out close to the release point and enable us to conduct surveys to see if the released larvae truly result in adult scallops. As part of the experiment, booms have been placed to temporarily constrain the larvae and hopefully ensure they settle where we can look for them when they have grown to a larger size. As part of the monitoring process, spat collectors have been placed to see if the young scallops settled near the release point. Spat is a term that refers to tiny scallops that have changed from the free- swimming stage to the bottom- dwelling stage that settles in seagrasses. Scallop researchers have been busy in recent weeks. Earlier in December, scientists and volunteers with the Sarasota Bay Estuary Program, Sarasota Bay Watch and Mote Marine Laboratory have conducted larvae releases in Sarasota Bay and have plans for an additional release. Also, Betty Staugler, Charlotte Co. Sea Grant Extension Agent was out Sunday afternoon (Dec. 16,2012) with volunteers conducting releases in Charlotte Harbor. Funding for this work was provided by the West Coast Inland Navigation District. Approximately 4-8 million scallop larvae were released at each event. It must be remembered that this work must be considered experimental at this time. Although results of a similar release years ago were promising, we must conclusively demonstrate that released larvae successfully produce adult scallops capable of spawning. If there is success, we can try and gear up for larger scale releases. Millions of scallop larvae may sound like a lot, but only a very small percentage may survive and grow to be adult spawning scallops. Years ago, attempts to transplant scallops from northern Florida proved to be unsuccessful. 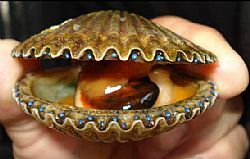 It is difficult and very expensive to transplant adult scallops on a large enough scale. Great care must be taken during hot summer conditions to ensure that scallops are not stressed. Even if they arrive alive, due to stress incurred during transport, their long-term survival and ability to spawn is in jeopardy.